Blended: Study for 7 months online (about 10-15 hours per week) followed by 4 weeks face to face. Total course duration is 9-12 months on average. Phonology: emphasis on teaching pronunciation unique to the Trinity course and highly valued by our graduates. Flexible: work at times to suit your weekly schedule. Choose from 3 dates for the written exam and submit your portfolio when you are ready. Take up to 3 years to complete the course if you need to. Professional: Learn from world class full time and guest tutors, including Lindsay Clandfield, Scott Thornbury and Adrian Underhill. Supportive: receive unlimited support via email and Skype from our Course Director. 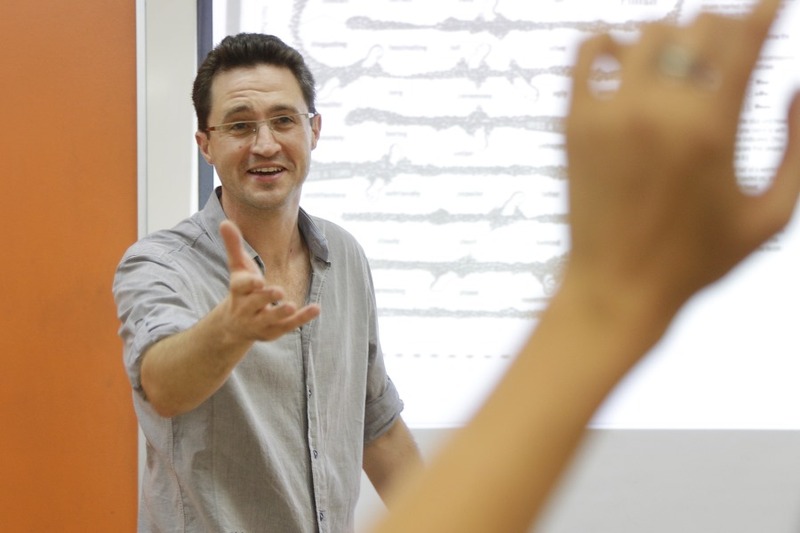 Recognised: Gain a prestigious, internationally-recognized and advanced qualification in ELT. work in the private or public sector with language schools, universities or teaching privately. Seven months online training in our virtual classroom with a group of up to 16 fellow teachers and our team of tutors, participating in forums, webinars, live video classes and e mail exchanges with fellow students and tutors. Twenty, week-long modules (with some rest weeks in between!) lead by one of our tutor team which you are expected to contribute to regularly, but the interaction is not scheduled (other than a 45 minute live video class), so you can log into the course throughout the week to suit your own working day. Weekly assignments helping you comprehensively prepare for exams and receive written feedback from your tutor so that you can visualise your development and performance against Trinity’s benchmark. What can I expect to learn during the online phase? Teaching practice, including lesson planning, observation and feedback from tutors. Time working individually and with support from tutors. You will have four internally assessed lessons and one externally with a Trinity examiner. You will also have an opportunity to be teaching without being assessed to get to know the students and get feedback and advice from tutors. There are four assessed units on The Trinity DipTESOL course. Unit 1 and Unit 3 are assessed by Trinity College and Unit 2 and Unit 4 by Trinity College and OxfordTEFL together. Unit 1 – A written exam taken in one of our centres, or in another Trinity approved centre or British Council centre, in May, August or November. The paper is three hours long and consists of a grammar section and two sections with essay questions about teaching and learning. Unit 2 – A coursework portfolio including three action research projects. The projects involve observation of other trained teachers, reflection on your own teaching and a research project where you collect data. The expertise of your tutor will be matched to your chosen field. Work on the portfolio will be completed throughout the course You will need to base the reflection task on teaching a group or groups of at least 6 students for 15 hours in total. Unit 3 – A 30 minute interview with a Trinity examiner on phonetics and phonology. Unit 4 – Assessment of your teaching of five one hour lessons, each preceded by a discussion of your lesson plan (10 minutes) and followed by a discussion of the lesson with the examiner (20 minutes). Four lessons are assessed by Oxford Tefl tutors, the fifth by a Trinity examiners. For this part of the exam you will be teaching students in one of our centres. You may be able to complete up to two of the Oxford TEFL assessed lessons via video with your regular students prior to the face to face part of the course. Once you have completed the course and passed the assessments you will be awarded the Trinity Diploma in TESOL. This is an internationally-recognized and respected advanced professional qualification for English Language Teaching. Many UK universities are now offering credits and/or exemptions on their MA and other courses for those who have obtained their DipTESOL. We are committed to providing our graduates with the best lifelong careers support possible. We work with you before, during and after the course to help you secure a new job if that is your aim. Since 1998, we have helped hundreds of our graduates find work all over the world. We have an Oxford TEFL Jobs Facebook page which is updated regularly with jobs around the world. You can also stay in touch with our community of teachers, trainers and graduates by joining our Trinity DipTESOL Facebook group (exclusively for our teachers, graduates and trainers). How can I enrol in the Trinity DipTESOL course? Step 2: You will be contacted within one working day to arrange a telephone/ Skype interview with the course director. We will ask you about your teaching experience and language awareness to help decide whether this course is suitable for you. The interview is also an opportunity for you to ask questions about the course and decide if it is right for you. Step 3: If your interview is successful, we will email you a full place offer with information about how to reserve your place on the course by paying your deposit. What payments will I need to make? All of the fees for the course can be found on our Diploma dates and prices page. What are the entry requirements for the Trinity DipTESOL course? At least two years full-time teaching experience (or equivalent) teaching English as a Foreign or Second Language. The experience can be with any age group or in any teaching context. A Certificate in TESOL/CELTA and a degree or proof that you would be able to cope with a course of study at post degree level. When can I take the Trinity DipTESOL course? We offer two dates per year to begin the 7 month online phase: January and October. The face to face phase usually takes place in the summer.